The Patterdale Terrier, sometimes called the "Black Fell Terrier," is not as high energy as some other terriers, but don't be fooled, he is still a lively fellow. This dog was originally bred for hunting or ratting so he still possesses those instincts, which makes him not for the average family. The Patterdale Terrier is a hunting companion so does not do well with smaller animals. If you are not looking for a challenging breed that will chase at the sight of any mammal, this breed is not for you. He loves to dig and will go after anything that moves. Willing to please, loyal, and intelligent, the Patterdale Terrier has a strong hunting instinct that regularly leads him off. This breed should always be kept on a lead or a fenced in area, as he can be difficult to catch when he gets going. Very independent, yet can be loving. As this breed has such a short coat, minimal grooming is needed to keep the Patterdale Terrier in tiptop shape. Brushing with a firm bristle or rubber brush will remove excess hair. This breed does love to dig so be sure to clean his feet before coming inside. 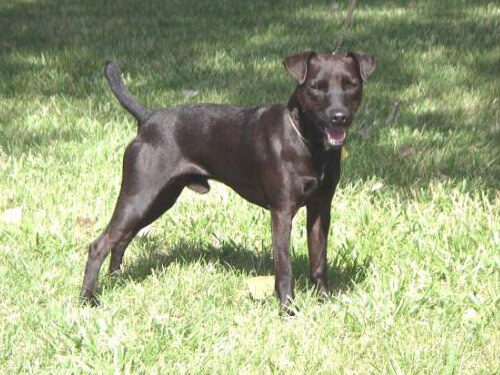 The Patterdale Terrier, usually seen in black, has a short and broken coat. The coat should always remain coarse. There is also the wire variety. The Patterdale Terrier can be very difficult to train. He has a very short attention span and if given the opportunity, will bolt at the first sign of movement. A firm and experienced handler is a must if this breed is to become properly trained. The Patterdale Terrier requires regular exercise, and should not remain without a fenced yard. If left in a yard unsupervised, he can dig underneath the fence. The fence should be firm in the ground, and high enough so he cannot jump it to find game.